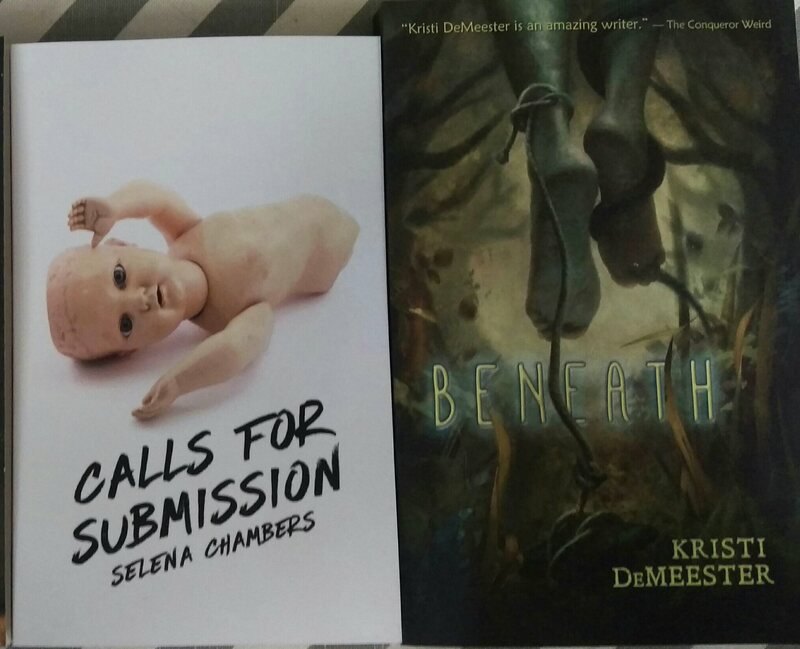 Selena Chambers – Calls for Submission (I had a gift card, and it shipped a week after I was supposed to receive it. Amazing how expectations are changed with expectations attached. I intended a quick post around TCAF, but it didn’t happen. 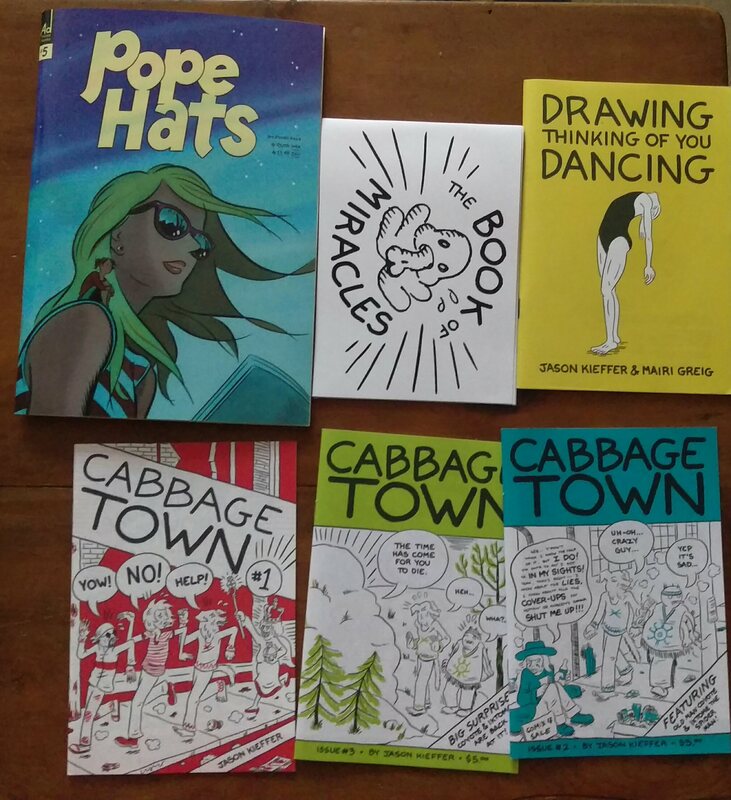 I hung out with my friend Julian, got a few comics (Ethan Rilly, Jason Keiffer, Nick Mandaag), and got a Slow Mosey sampler from Katie Sawatsky. I read more of the books I had started. Working on reviews for both. Postcripts to Darkness 6. I got my copy signed by a few contributors. Started listening to the Rabbits podcast, and I am enjoying it very much. It’s not quite the Black Tapes, but what is. Season one of A Scottish Podcast ended. It feels a bit more on the comedy side of things, but I enjoyed it. Part “monster of the week” format, with some over-arching story. A short burst of episodes mid-season hinting at cosmic horror, but mostly a lot of teasing, and humorous characters. The part on the island was the highlight of the series, but I just really love a Scottish accent. 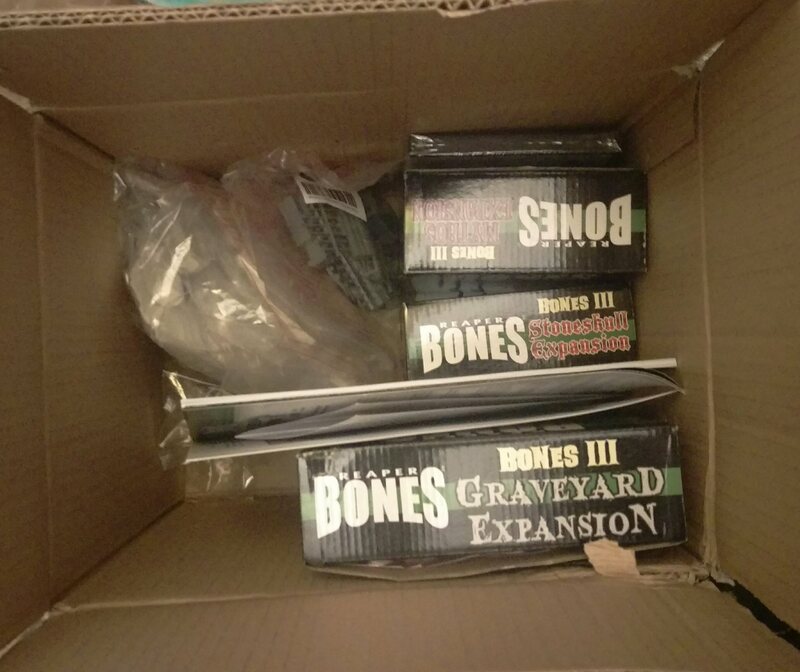 I received the BIG shipment of my purchase during the Bones 3 Kickstarter. 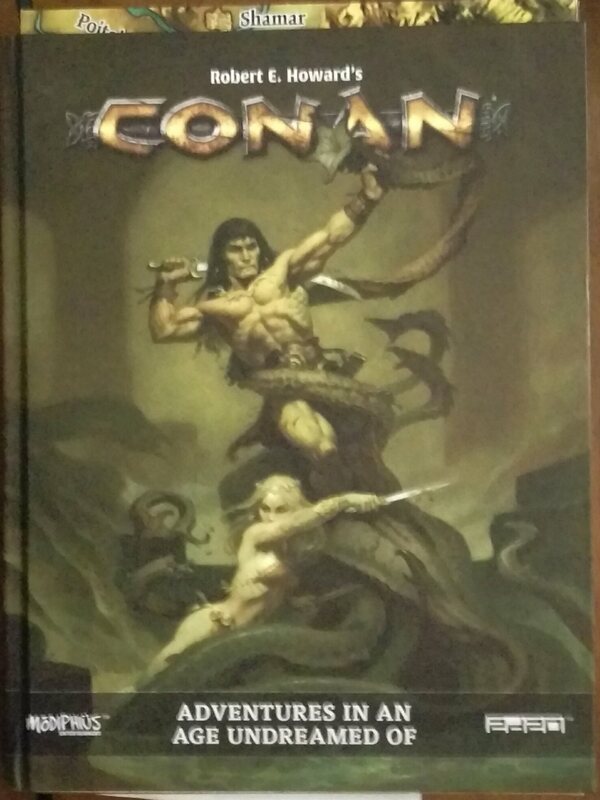 And Modiphius’ Conan – Adventures in an Age Undreamed Of. Mini on the bottom right is not part of the set, and was for scale. I Worked briefly at a job that was facilities management and records management, but getting paid 60% of the real salary to fix problems where 5% of files to be archived (I manually checked over 1000) can be accounted for ain’t worth the hassle. My wife is getting close to contracts for 2 books! I also got to sit in on an interesting conference presentation from ACCUTE. Getting to know the refugees I’m sponsoring. Syria sounded like a beautiful place at one time. It was interesting hearing about life there. Basic quality of life issues like rolling electric blackouts (2 hours on, 4 hours off), no heating. Hearing about going to the movies pretty much reinforced what we knew already – that there isn’t much difference between us, just details. Even with all of them speaking English well, we’ve run into a few small issues, and seeing how systems are just not equipped to deal with it has been frustrating. The subtle racism is there too, for example, landlords who don’t want to deal with refugees who have a sponsorship group. The irony is that to get approved we need a certain minimum amount of money collected, and so rent is more secure than with most tenants. Also frustrating was the Air BnB host who kicked our family out 1 day early with minimal notice. We were able to get them moved in to their “permanent” apartment, okay. This weekend is the BIG move, and our basement will be empty. It’s exam time again. I have until August 1 to study my brains out for something I am completely disinterested in. Hopefully I can manage shorter posts on a regular schedule. I’ve been disappointed in a few people’s reaction to the Hal Niedzviecki resignation. To be clear, it was the right thing to do. And the appropriation prize – both as he supposedly conceived it, and as has been created in response – is stupid and offensive. Support this Emerging Indigenous Voices Prize instead. Whitney French – is editing an anthology through the University of Regina Press that chronicles creative non-fiction by Black Canadian writers. Intended for a general audience and dealing with issues of systemic anti-black racism as well as black joy. Maximum 3000 words. Deadline is August 31, 2017. Check the website for contact info. 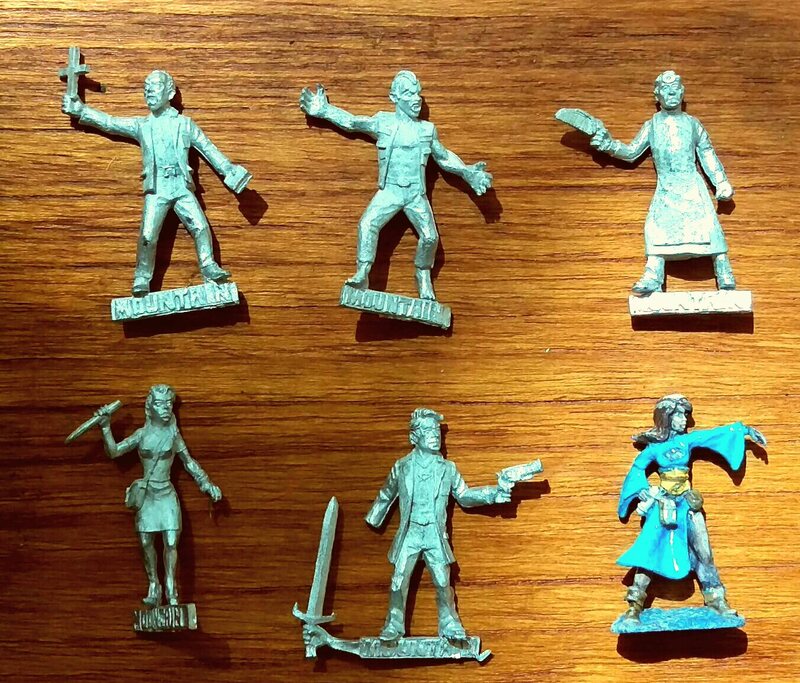 A new miniature Kickstarter from Paymaster Games. I recently found out that the Inquiry into Missing and Murdered Indigenous Women and Girls is being streamed. It just started. So far I’ve seen people telling the stories about their missing family. It’s intense, but not something to be scared of watching.